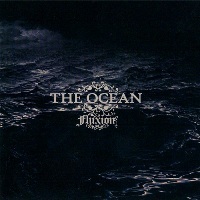 The German band THE OCEAN released ’Fluxion’ in 2004 but was never happy with the<?xml:namespace prefix = o ns = "urn:schemas-microsoft-com:office:office" /> initial release so this why they are re-releasing it on Pelagic Records. It’s kinda hard to describe the sound and style of this band. They are everything; progressive, ambient, atmospheric, metal-core, thrash-core, melodic death metal, doom and futuristic hybrid metal peppered with orchestral passages. Just think of a mix between <?xml:namespace prefix = st1 ns = "urn:schemas-microsoft-com:office:smarttags" />ISIS, NEUROSIS, MASTODON and a few others and you have a pretty good idea of what to expect. Music like this really need some time to sink in... and it’s certainly not for everyone, that’s for sure. I’m not sure that ‘Fluxion’ is something for the average traditionally heavy metal fan. No, you have to be pretty open minded and I must admit that the very first time I threw this disc in my hard-tried CD-player I felt pretty bored with the music. I wasn’t in the right mood to put it simple. But I gave it listen now and then when the mood was right, and now numerous spins later I actually like what they have to offer. Well... as written above; ‘Fluxion’ is not for everyone. It’s music for a certain mood and if you’re ready to challenge your brain cells with lots of details, then try this one out.